Kershaw National Wild Turkey Federation Echo Semi Skinner. 8 1/2" overall. 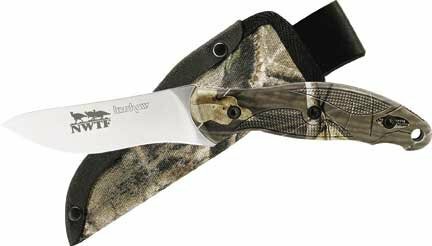 4" AUS-8A stainless blade etched with NWTF logo. Full tang. RealTree Hardwoods HD camo finish polyimide handles with lanyard hole. Camo finish cordura belt sheath with liner. Designed by Ken Onion.